OMG you guys will have some wind this weekend, lol. The forecast probably will change though. I only see 16 registered name. I plan to bring food but base on the list, it will be very little. I have two turkeys for the event. That should be enough with the amount of people registered as of now. I also picked up the peanut oil to fry them in. For those who are going and have not posted what they are bringing, now is the time. Debbie and I will pumpkin bread dessert and a sweet 'n sour cole slaw (no mayo) side dish. Thinking about bringing a rice dish (pilaf or dressing), too. I would like a confirmation as to which location we'll meet at for both the pre-event and the main one. Turkey Day weather forecast is looking good! I'll be cooking on the beach as usual: sweet potatoes, green bean casserole and apple cobbler. I'll be bringing my one table for the food. If anyone else can bring another folding table or two that would be great. The pre-event and event will be held at east beach. Looks like we will have wind all week but it will be coming out of the north , northeast so will be side shore. Weather is gonna be a little cool. I have a folding table I can bring. Susan, I will let you take care of the turkey. I will do the usual BBQ/Grill food. Ready for Sunday morning. So what's it like at East Beach now? Is it flooded, muddy, or...? i will be down Friday after Thanksgiving and Saturday as well. Where were you guys Sunday? 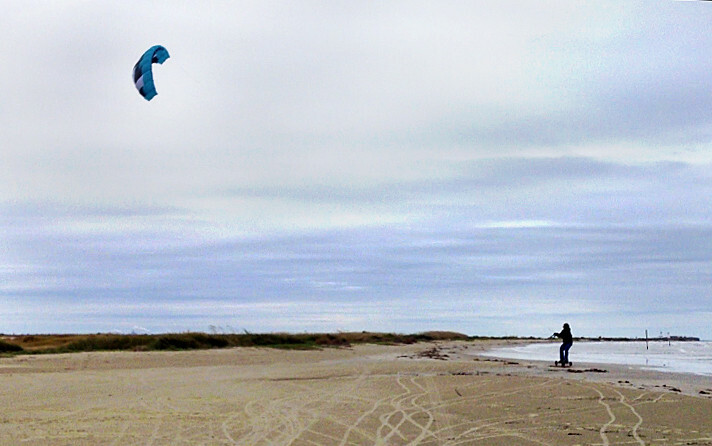 I was the only one there with the exception of two kitesurfers who haven't heard of the event yet. I told them to check it out on Thanksgiving. I went to East Beach at 9:00 AM expecting a crowd, but there were no Dead-Birders to be seen, to my surprise. 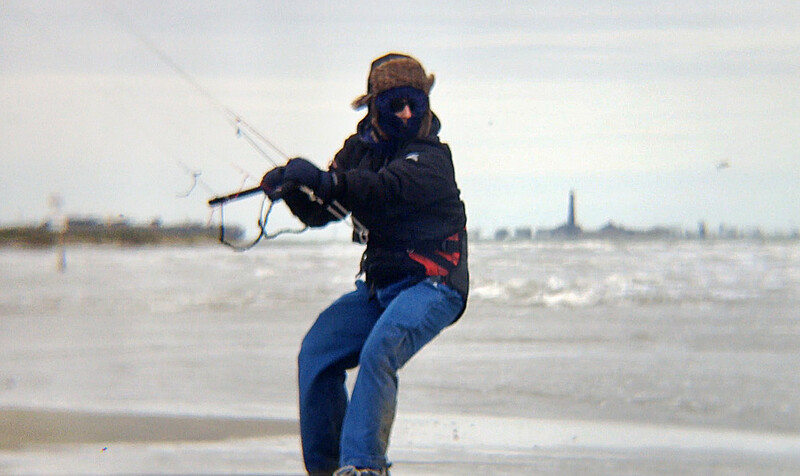 After some solo kiteboarding, I decided to leave at 1:00. I was not at the beach, but I tested out my cooking gear Pre-Turkey Turkey event was magnificent. Dinner at 2pm as always????? Me again. As you can see I am well-prepared for wind chill. Sorry to miss you, Sier! I must have arrived just after you left and you are correct, there were no kite flyers or power kiters in sight. I flew my new Peter Lynn Viper for a while, and then put up a big delta to keep me company while I ate my catfish dinner. Packed up after dark and, after watching the light show of the Carnival cruise ship head out to sea, made my lonely way home as it began to drizzle a cold depressing rain. Sniff! Been there done that. If just one other person shows up, particularly with the makings for hot chocolate, it can be a good time! Otherwise... bleah. Funny (sorta) story. I woke up on East Beach one morning and was about to connect the MiFi to the laptop when I got a pop-up saying networks available. It said Carnival. Looked out the window and sure enough, there she was heading out to sea. Hoping it gets better by turkey day. Y'all have fun! Buggy Texas before it Bugs You. Well, I probably should have mentioned that my dad was there with me as well. He tends to play the roles of supervisor and kite-launcher while we are at the beach. We have a zoom lens for the iPhone 4S that was used for the second photo. The weather forcast for this week is just...sigh... Raining when there is wind and light wind when it's sunny. I'm praying for more wind this weekend or I'd have to borrow a big FB kite. We had plan to be down there all weekend but then got a call saturday morning that my mother in law pass away. This put a major pinch in our plans. My wife is a wreck right now. I'm trying to see if I can get her away from the house and come to the beach. If she sees some old friends, it might make her feel better. If I don't make it down there this year, enjoy some turkeys for me and the wife. I hope you can make it Van, but if not I understand. Tell your wife I am sorry for her loss. I think I am going to drive in to Galveston tomorrow (hump day) instead of today. With the wind forcast for today and tonight I am not sure I can put up the trailer. Looks like Thurs. it will also be warming up into the 50's instead of the 40's today and tomorrow. I hope everyone has a safe trip and see you on the beach. Any of you will happen to be there tomorrow afternoon? I might go down there if I can get off work early. Otherwise, I'll see you all on Thursday morning! Depending on what time I leave I may or may not have time to go to the beach. I'm hoping to be down there in the afternoon.